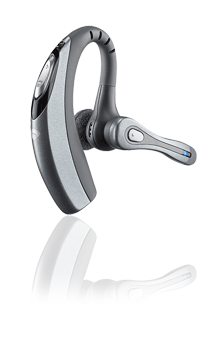 Plantronics Voyager 510 is a Bluetooth headset for multiple Bluetooth devices such as computer and mobile phone that can be easily attached to by using a special Bluetooth USB adapter multipoint technology. The Bluetooth headset can be used for VoIP telephony with PC, has optional base adapter to Bluetooth-enable your office phone. Tech Blog has reviewed Plantronics Voyager 510 Bluetooth headset. Web-User (dead link) also reviews Plantronics Voyager 510 Bluetooth headset and concludes that this is a unique device that pulls together your headset needs for both VoIP and mobile. Although you could do this before if you had the right equipment, this Plantronics device streamlines the process, so fiddling is minimised and swapping between the two is achieved quickly and simply. If you already keep a Bluetooth headset glued to your ear for your mobile phone, you can now also keep it in while you’re sitting at your PC, waiting for your VoIP calls to come in. PC Magazine concludes with rating 4.5 out of 5 that Plantronics Voyager 510 headset is an excellent companion for Bluetooth-equipped mobile phones. Good point of it are extremely comfortable, excellent range and excellent indoor sound quality. While the bad points are tiny power button and could do better at screening out wind noise.